If there’s one thing party people really love, it’s unicorns! In fact, one of our long standing most popular posts on this site is 25 Unicorn Party Snacks for the Most Magical Party! And we believe unicorns are great anytime of year… even at Christmas! 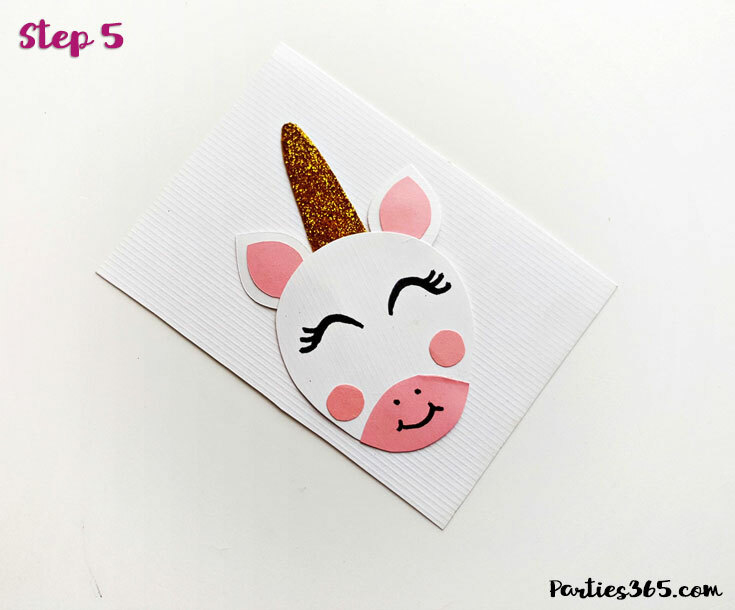 That’s why we created this adorable Unicorn Christmas Ornament tutorial and printable for you! 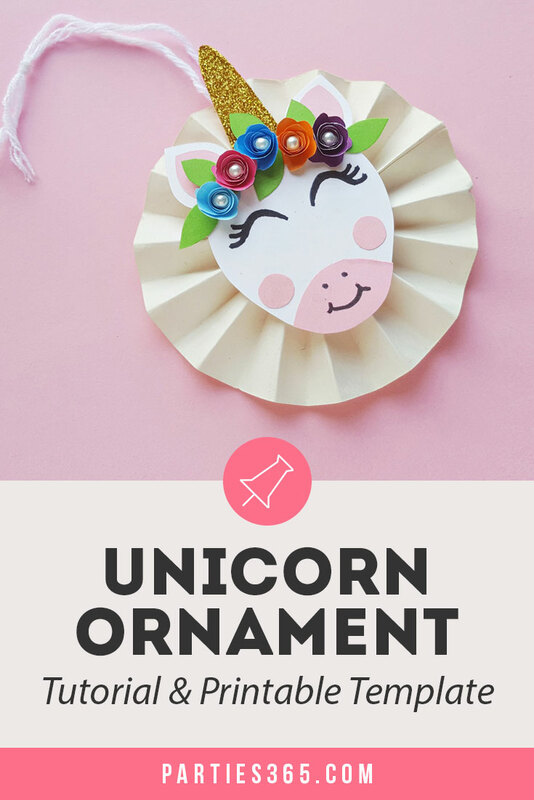 This DIY ornament would be the perfect activity for a Kid’s Christmas Party or a Winter Birthday Party. 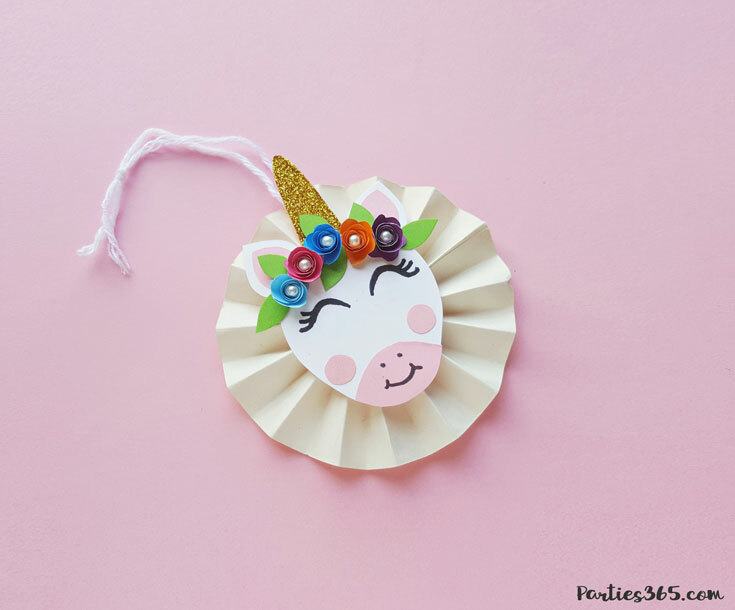 Check out all the details of this beautiful paper unicorn craft and you’ll have the most magical tree in the neighborhood in no time! 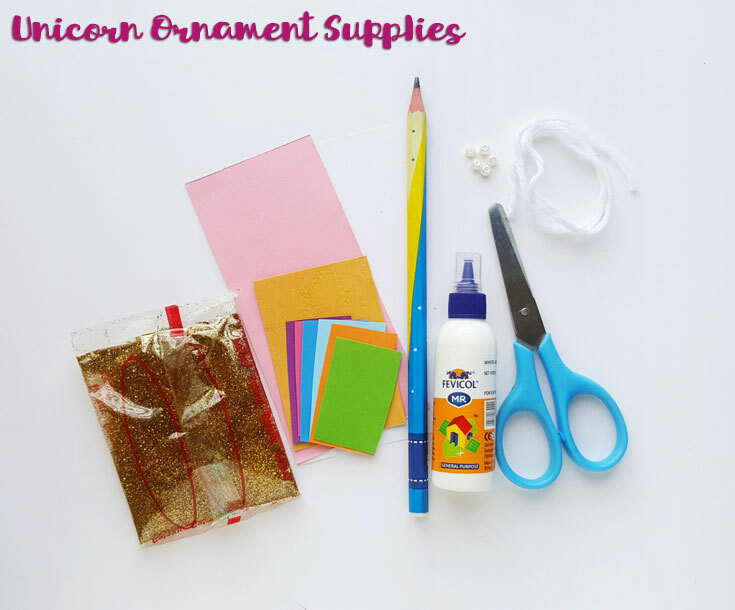 These unicorn ornaments are so adorable and would be perfect at a Christmas Playdate or Children’s Christmas Party. And let’s be honest, they’d probably be a lot of fun to make at girl’s night while you’re sipping wine and eating Christmas cookies, catching up with your girlfriends, right?! Step 1: Trace the patterns on the selected colored craft papers from the given template (download the template for free in our Party Printable Library). 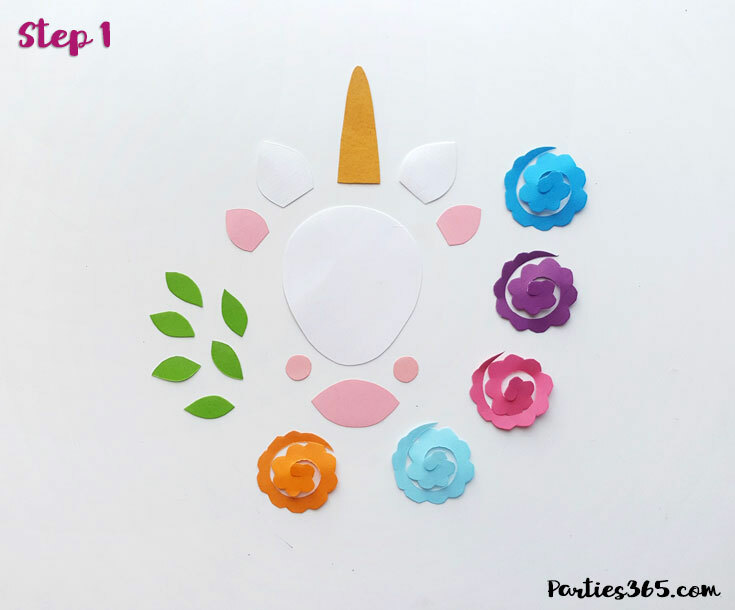 The template includes 2 outer ear patterns, 2 inner ear patterns, 1 horn pattern, 1 mouth pattern (bottom part of the unicorn’s face), 2 blush patterns, 5 spiral flower patterns and 6 leaf patterns. Cut each element out. 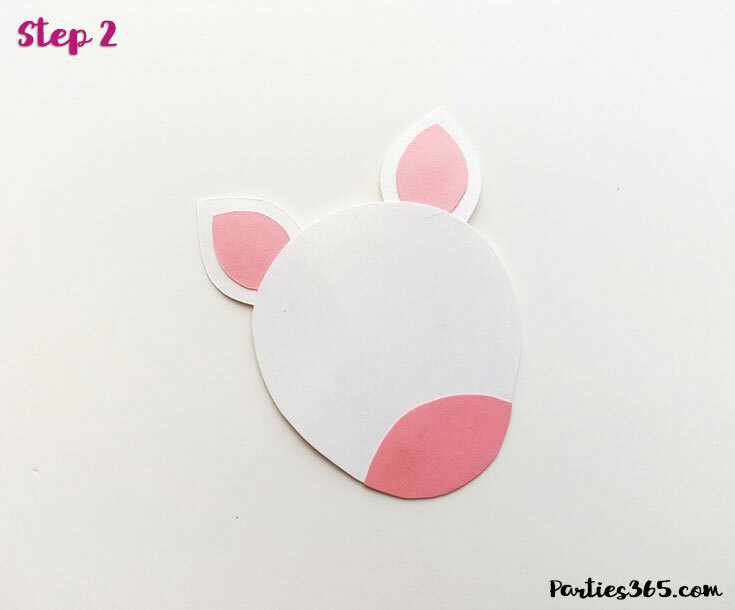 Step 2: Attach the inner ear parts (pink) to the outer ear parts (same color you chose for the unicorn head). Glue the ears on the 2 sides of the unicorn head’s top end. Glue the mouth element on the bottom side of the head. Step 3: Glue the 2 blush elements on both cheeks. 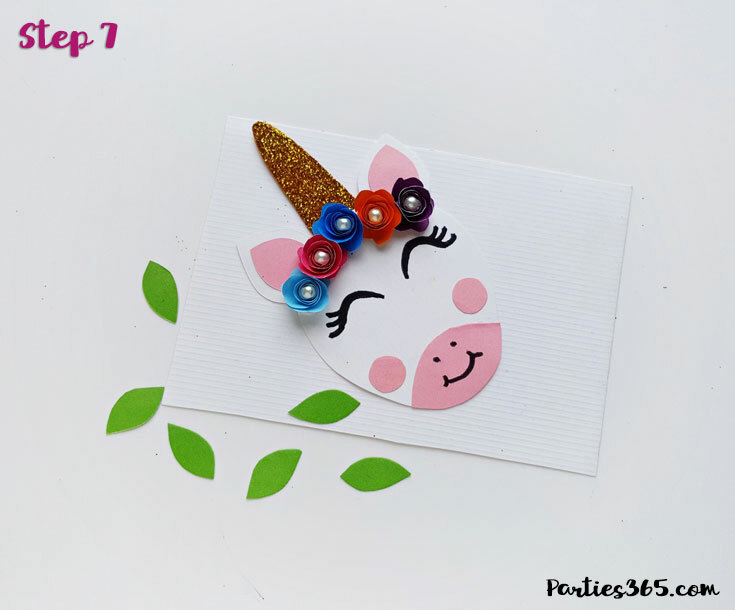 Use a black sharpie to draw the eyes, nose and mouth of the unicorn. 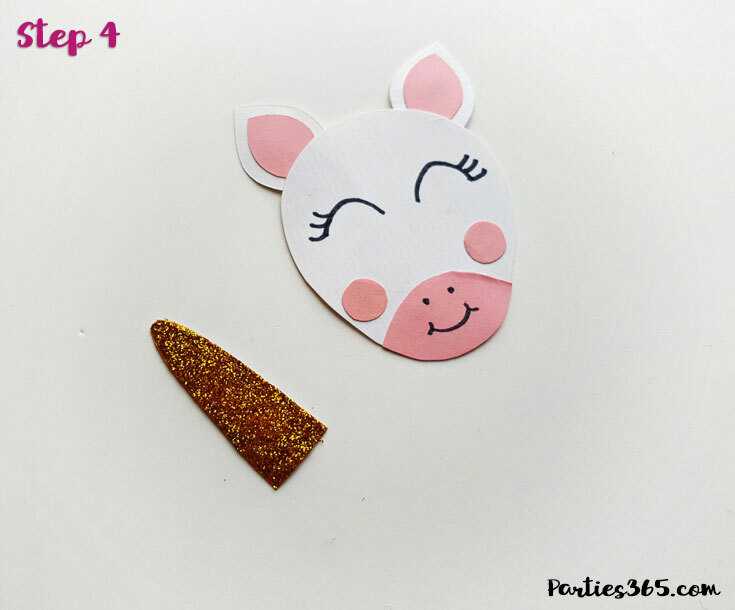 Step 4: Take the horn cut out and using your glue, apply golden craft glitter all over it. Step 5: Glue the horn on the back side of the unicorn head’s top end, in the middle of both ears. Step 6: Create flowers with the spiral elements. Simply roll the spiral from the outer edge all the way to its center and then glue the rolled part with the center to secure it. 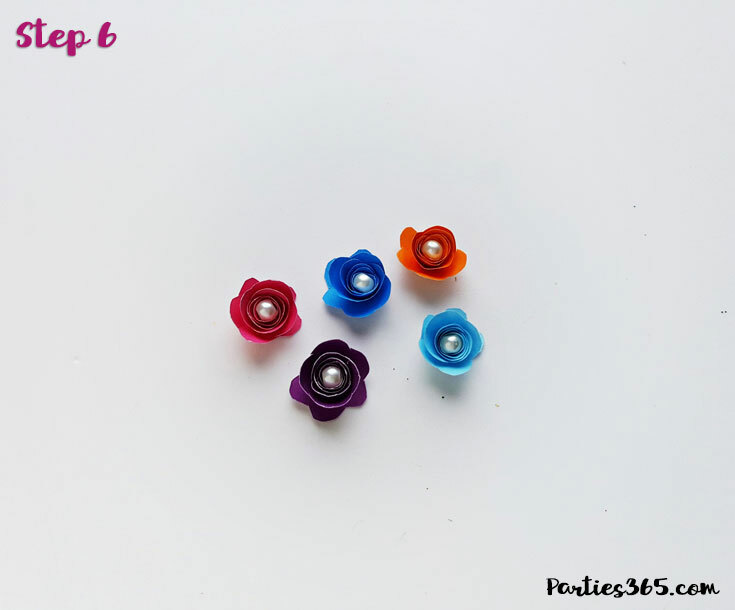 Glue a small bead on the center of each flower. 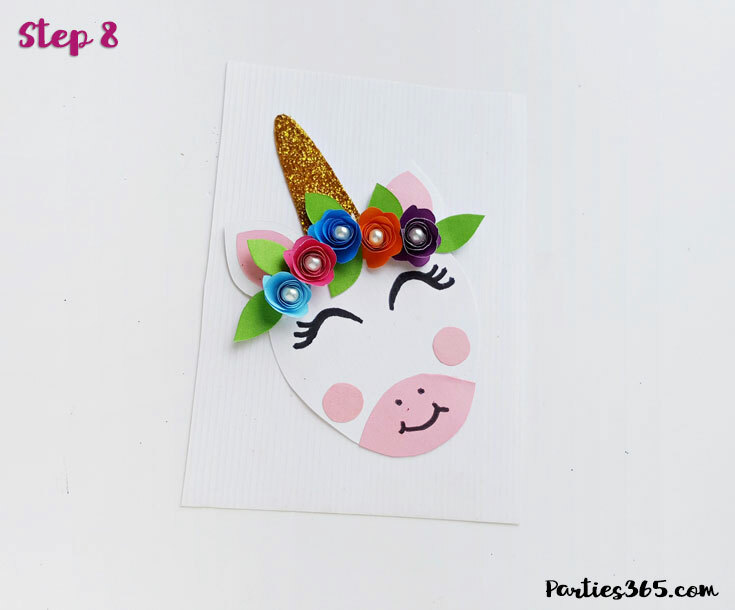 Step 7: Glue the flowers along the top side of the unicorn head, below the ears and horn. Step 8: Glue the leaves between the flowers. 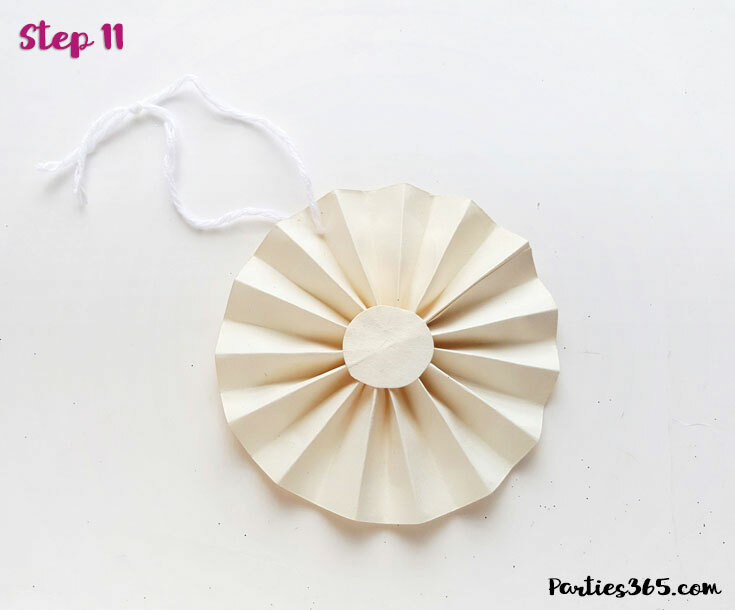 Step 9: Select a piece of craft paper for the ornament itself and cut out a strip that’s 15 inches long and 2 inches wide. Create small and even accordion folds on the strip. Step 10: Glue both open sides of the accordion folded strip. 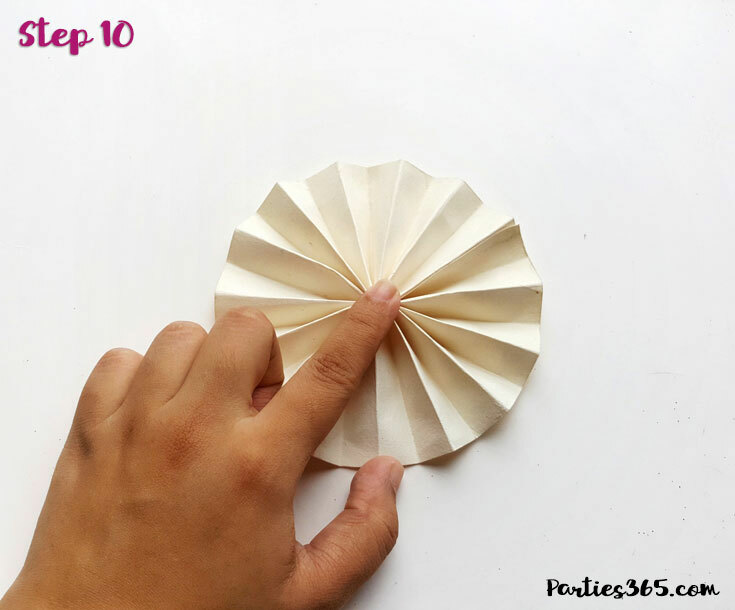 Hold any one side of the roll (accordion folded roll) and press it towards the center to flatten it. 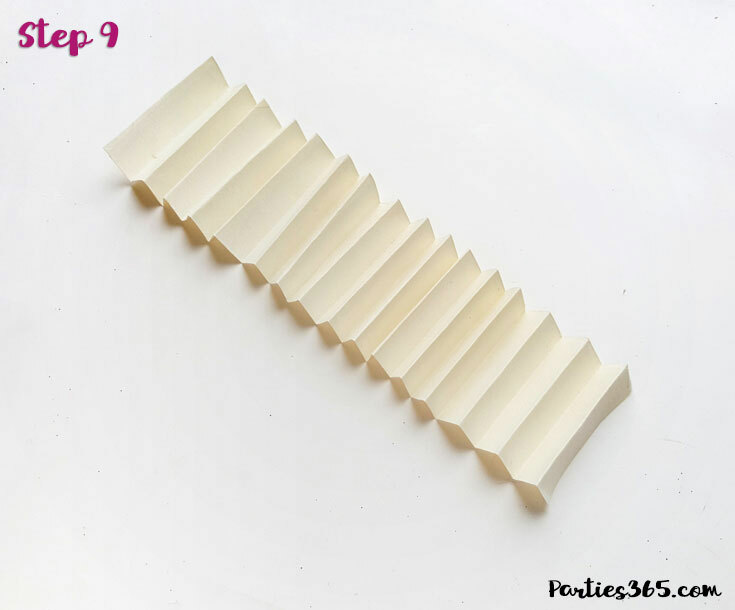 Cut out 2 round patterns and glue them on the center of the flattened accordion folded piece, on both sides (see Step 11 image for detailed view). Step 11: Cut out a small piece of yarn or string and tie its open ends together. Attach it to the accordion folded piece. You can either glue the yarn or make a hole on the accordion folded piece and then attach the yarn. Step 12: Finally, attach the unicorn head right to the center of the accordion folded piece and allow the glue to dry completely. And viola! 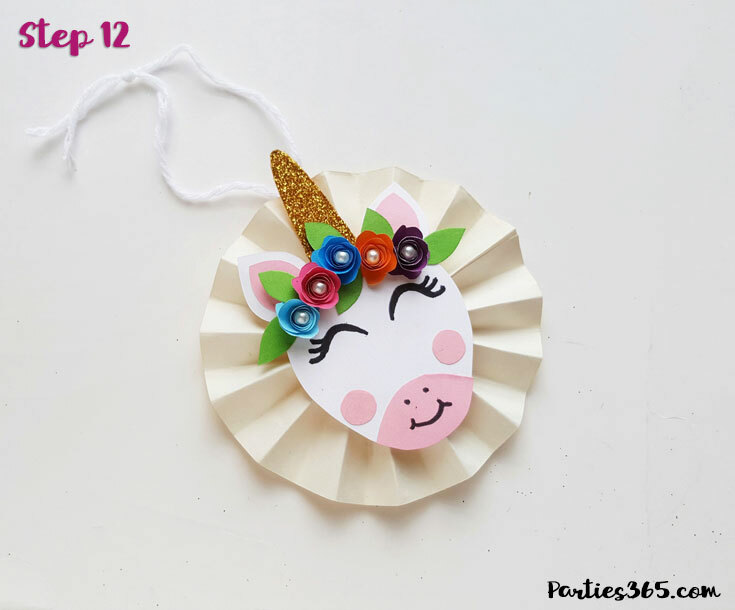 An adorable Unicorn Ornament to hang on your tree or send home with guests as Christmas Party Favors! 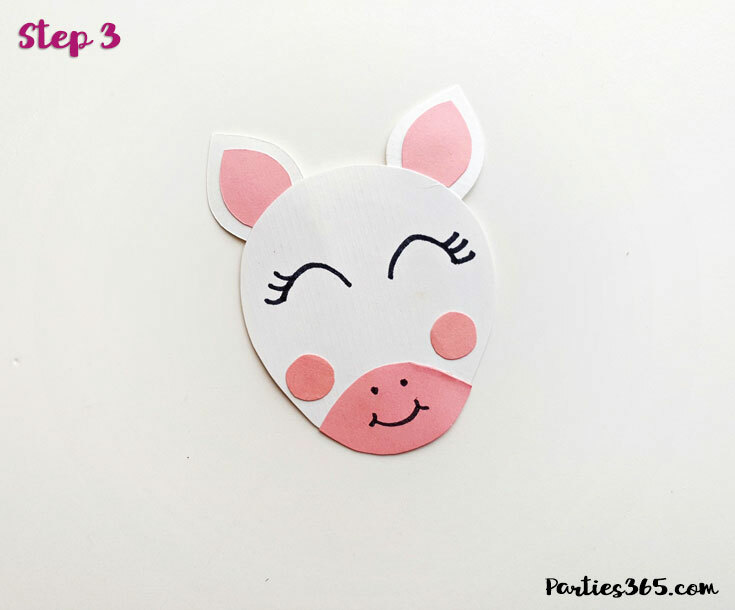 If you have younger children doing this craft or if you just want to simplify the process, you could prep the materials by tracing and cutting out all the elements in advance. I also love how versatile the final unicorns could look by changing up the colors of your craft paper! You could make your unicorn feel more “Christmasy” by using reds and greens – or turn her into a reindeer by adding antlers! Let your creativity run wild and enjoy this fun Christmas craft with your family and friends! 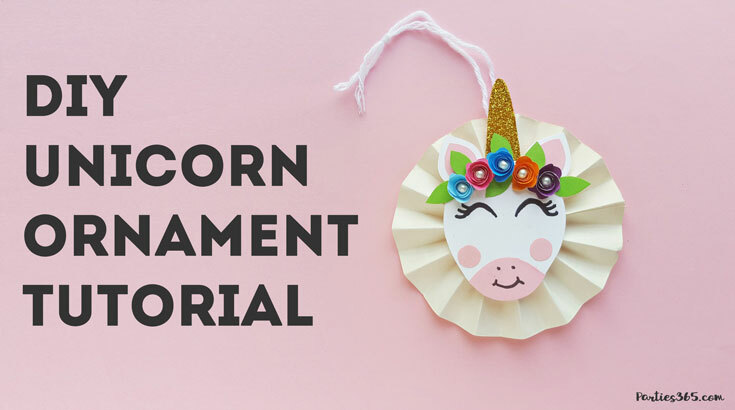 Be sure to Pin this post for later and download the free Unicorn Ornament Template from our Party Printable Library!